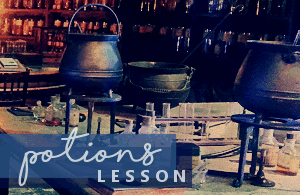 The classroom looks pretty much the same way as it usually does as you enter: the desks are set up in front-facing rows, each individual workstation set up with a burner and tripod for your cauldron. It was clearly a practical lesson today, even if you hadn't checked the schedule; the side workbench had several trays of ingredients laid out neatly. All seemed normal then. At least until you cast your eye on the front desk. There, you see a the cluster of small, brightly coloured balloons on strings floating next to where the Potions professor was lent back against the front desk. Was it Noble's birthday? Or were they for the lesson? Why might we want to change our voice? What does helium do to your voice? Focusing on...the voice...? In Potions class? What on earth could this lesson be about? Thought Heather. It was a rather...odd...topic to discuss in this class. After all, the voice isn't really the first thing that would come to mind in a class such as this. However, it would be a lot different in a class like Charms or Transfiguration even, as those could have some potential spell revolving around it. Whether it was through amplification or nullifying the resonance of our vocal folds, there were spells in both of those fields in one form or another that could deal with the complex process of speech patterns. Thinking about it, the question posed was a rather simple one, as there were several ways to change the voice, both magical and nonmagical. Raising her hand, signet ring sparkling in the light, Heather stated with confidence "Professor, there are many different ways in which we can change our vocal patterns. Magically one could cast Sonorus, which would amplify the voice. Or, to soften it the caster could use Quietus." She took a brief pause before speaking again with the reasoning behind why someone would want to do either of these. "A person would want to amplify their voice if they were in a large area such as an arena. And then on the other hand, if you wanted to do the opposite, to try and not be heard other than by the person next to you, you would cast the counter charm to Sonorus." Tina felt a wave of relief wash over her when Professor Noble accepted her answer, but the feeling vanished the moment she saw that eyeroll. What was -? Oh... Her heart sank. She had thought of art, but she had been too afraid to mention it. Of course...serves her right for trying to play it safe. When was she going to learn that the safe answer was never safe? Tina wasn't a bit surprised when Noble said they would be focusing on vocal communication today. It seemed to lend itself to potions more than the other forms. She considered the next question. Volume was the first thing that came to mind. People modulated their voices to be louder or softer, either by manual or magical means, depending on their situation... but that Slytherin girl (Heather) mentioned that before Tina had the chance. Great, now she'd have to come up with another answer! She continued thinking for several moments until an idea came to her. What about singing? That involved manipulating one's voice to fit the tune of a song. That wasn't too crazy of an answer, right? Tina tentatively raised her hand. When she was called on, she said, "When we sing, we adjust the pitch of our voice to match the notes of a particular song." As she spoke, her eyes flicked toward the balloons at the front of the room, and a lightbulb went on in her mind. "Speaking of adjusting one's voice, I wonder if that might be the balloons' purpose. I remember reading something about helium amplifying the higher frequencies of one's voice." A potion to emulate the effects of helium? Or perhaps counteract them? If Nettie had known about Noble's inner thoughts, and known that HE of all professors had noticed she had been moody and distant, she would have thought it hysterical. Instead, her face fell a bit as it became obvious that this potion wasn't some sort of cool translation sort of potion, as she had hoped. SIGH. That was a long shot, she supposed - but STILL. She raised her hand again. "If you don't want to be recognized, you would want to change your voice so people wouldn't know it was you speaking, if they knew what you sounded like. It would probably be beneficial to also do some sort of transfiguration on your face, unless they can't see you." she explained. Like if someone was on the run from the law or something. Valencia raised her hand. "Sometimes my dad has a really even voice when he's 'disappointed' in something my brother did." True story. "I think he does it so we know he's not mad -- but the voice is kind of worse." And yes, it was usually always her brother that was in trouble. Daisy scratched her head as she thought of an answer. Did Professor Noble mean both magical and mundane methods? She raised her hand and bit her lip. "I might be way off the mark here but there is the Volubilis Potion. People like to impersonate the voices of others for a lark." Natasha raised her hand. "If someone does not want to be overheard, they can whisper to the person they are talking with." Noble nodded at the first year. “Whispering is a great answer, yes. And something those of you at the back should realise I can see you doing, even if I can’t hear you right now.” Just saying. He moved along the front desk now, to the bunch of balloons. Cutting one of the strings, he took a bright yellow balloon. “Helium is a gas, lighter than air. These balloons are full of it, which is why they’re floating with no magical help.” He let go of the string momentarily, letting the balloon drift upwards for a second or two before catching back hold of it. “It also does interesting things when interacted with our vocal chords.” He unknotted the balloon now, held it up to his mouth, and took a breath. When he spoke again, his usually deep, grumpy voice had gone squeaky – to quite a comical effect. “See what I mean?!" Squeaky squeaky. He might have even cracked the slightest of smiles at himself. Last edited by hermygirl; 03-08-2019 at 04:48 PM. Daisy wanted to get into some potion-making and was getting a tad bored. This led to her giving a very small smile when Professor Noble inhaled some helium and spoke in a squeaky voice. Daisy grabbed a yellow balloon and unknotted it. She gently inhaled and turned to the person on her right. "Hey, there. How are you? Boy, I sound weird." Why was Daisy bored? And wow was Noble loud and squeaky! So Vivienne followed suit and inhaled helium. "Hello everybody. I'm Mickey Mouse!" Natasha fetched her balloon, then returned to her seat, next to Daisy. She couldn't help a little giggle at how her classmate sounded. Before replying, she inhaled from her own balloon. "I'm good, how are you?" She giggled at her own voice. She had heard of this trick before, but had never tried it. "I'm Natasha." She noticed how the helium was already wearing off. It was a great way to drastically alter the voice, but only for very short periods of time. The squeakiness had worn off so Daisy inhaled more helium from her balloon and replied to the Ravenclaw first-year in her altered voice. "Hey, Natasha. Are you enjoying your first here at Hogwarts?" Natasha inhaled more helium from her balloon to reply. "Yes I am, it's very interesting." She managed to say in a high pitch, squeaky voice, before the helium started wearing off. At first, Tina wasn't sure how well her answer would be received. She was relieved when Noble praised her answer, but then… Blink, blink. He was disappointed nobody thought of yodeling? Merlin, she hoped he was joking about that (though she wouldn't be entirely surprised if he wasn't)! It was hard to tell with him sometimes. Oh well, it didn't matter. The praise was nice while it lasted, and she'd more or less correctly guessed the balloons’ purpose in the lesson. That was pretty cool, she guessed. Tina paid attention to Professor Noble's demonstration, and the slightest of smiles crossed her face. She didn't find the effects of helium particularly funny in and of itself - that was one of the oldest party tricks in the book! It was more the odd juxtaposition of that squeaky voice coming from the grumpy potions master that amused her. As she got up to collect a balloon from the front of the room, she wondered what her own voice would sound like. Probably like a snooty French Minnie Mouse, she thought. The helium may change the way her voice sounded, but it wouldn't disguise her accent. Great, just what she needed. Group work and looking silly… it looked like this activity was going to combine two of her least favorite things! Well, better get this over with! Tina returned to her seat, balloon in hand. She untied the string, held the balloon up to her lips, and inhaled. “Hello! How are you today?” she said, turning to her neighbor (Anna). Merlin, she sounded ridiculous! Was she done now, or did she have to keep talking until the helium wore off? It was going to be awkward if she did! She wasn't much of a talker, even without the helium. He let them have their time trying the helium, the room filled with squeaky voices. There was only so long he could take of the racket though, and he soon clapped together his hands to bring everyone back to attention. He rounded his desk, preparing to move onto their main practical. "As you've probably realised, the effects of helium are short-lived." Thank goodness. "It's also not healthy to do for prolonged amounts of time, since we need air other than just helium to breathe. However, as Daisy alluded to earlier, there's a magical way to change our voices: the volubilis potion." He wrote the name on the blackboard in white chalk, underlining it with a flourish. "Not only can it change how we sound, it can also be used to restore the voice, and thus can counter the silencing charm silencio as well as healing applications." He put the chalk down on his desk now, and moved to his cauldron. "Over the next half an hour, we'll be brewing the volubilis potion on page 57 of your textbook. If you succeed, you'll be able to take some away to experiment with." If they wanted to; he wouldn't force them. "To start, put 50g fluxweed and 50g billywig stings in your mortar and grind into a smooth red paste." He demonstrated, holding up the mortar to show them the paste they were looking for. "Scoop that paste into the cauldron, and heat over a medium flame until it turns green." He lit his burner with a non-verbal incendio, adding the paste and watching the colour change. "It should only take 45 seconds or so. Then add 8 drops of honeywater one at a time. The liquid will turn pink, and then we're going to simmer it for 5 minutes." This was one of those potions that was all about using colour to inform when the next step should happen. Easy enough, but required focus. Alters the drinker's voice. Restores their voice if they have lost it, and thus will end the effects of the Silencing Charm. 1. Put 50g fluxweed and 50g billywig stings in your mortar and grind into a smooth red paste. Add to the cauldron and heat until it turns green. 2. Add the honeywater one drop at a time until the liquid turns a bright pink. Simmer for 5 minutes, or until the potion turns orange. 3. Add three mint sprigs, stirring between each. The mixture will turn green-blue as each sprig is added, but should return to bright pink after stirring. 4. Chop the stewed Mandrake into fine slices with a silver knife, and sprinkle over the potion. 5. Pour in 30ml of syrup of hellebore. The potion will turn blue. Simmer the potion for 15 minutes, after which it should have turned a sunshine yellow. 6. With your wand, touch your wand to your throat and then sweep it over the cauldron from left to right. Once finished, the potion should release some sparks. Um, transfiguring your face to complete your disguise with a new voice was TOTALLY on topic, Mr. Grumpy Professor. Honestly, what did he expect from a Ravenclaw? She just sat in silence, sighing heavily and continuing to take notes. Helium? No thank you. She felt like her voice was high enough as it was - it didn't need to sound like a cartoon as well. Although...she WAS curious. She couldn't help herself. Taking the balloon nearest her, she sucked in just a teeny bit of the helium. "Hello, I'm Trinetta Gladin," she said to no one in particular. OH MY GOSH. She sounded like a cartoon duck! Cheeks blushing, she immediately shut her mouth, hoping the sound would wear off when she decided to finally talk again. Oh good, they were starting the brewing portion of the lesson. Nettie listened and took notes as Noble went over all the instructions, and then once they were instructed to start, headed up to the ingredients and began to gather her things. Once she got back to her station, she took out her mortar and pestol and added the 50 grams of fluxweed and 50 grams of billywig stings. She ground it down, using all her strength to make sure it was made in to a nice paste (which was quite a task for her, since her arm strength still wasn't that great even with all her Chaser practice). Before continuing, she paused and waved her wand over her cauldron. "Scourgify!" she muttered, making sure to clean it out before adding the red paste she'd created. Then, she pointed her wand at the base of her cauldron and muttered "Incendio!" to light the flame. She adjusted the heat so the flame was medium sized and then waited, watching as slowly, the red paste began to turn green. Daisy turned to Page 57 of her Potions textbook and then went to fetch the necessary items to make the Volubilis Potion. At her workstation, Daisy quickly did a non-verbal "Scourgify," on her mortar and pestle, scales, large tweezers, spoon, dropper and cauldron. Daisy measured 50g of Fluxweed and used her tweezers to place it in the mortar. After cleaning the scales and tweezers, she measured 50g of Billywig stings and placed them in the mortar. Using the pestle, Daisy ground the Fluxweed and Billywig stings into a smooth red paste. Daisy used her spoon to help scoop the paste into her cauldron which was sitting on top of the unlit burner. "Incendio," Daisy non-verbally cast so that the heat was on medium. As she waited for the paste to turn green, Daisy cleaned her mortar and pestle, tweezers, scales and spoon using a non-verbal "Scourgify." After forty-five seconds, the contents of the cauldron had turned green and so she added eight drops of honeywater at the rate of one drop at a time until the liquid turned a nice shade of pink. Daisy then let the potion simmer for five minutes. Once the potion was green, Nettie took the honeywater and held it over the cauldron. Carefully, she added a small drop one at a time until she'd added eight drops. The green slowly turned to a bright pink color, just as the professor had said it would. She smiled and then set her timer, adjusted her flame, and let it simmer. She waited for five minutes and then checked her cauldron. It was now an orange color - this potion was starting to remind her of a rainbow! Now she had to add the mint sprigs. She took the first one and added it, and then took her stirrer and stirred it. She watched as the potion went from green blue after she had added the sprig, to bright pink as she stirred. She took another sprig and added it, repeating the process. Then the final one...she stirred and then waited as the potion turned back to pink after she stirred it. On the other hand, Nettie earned a grumble when the Potions master reached her cauldron. “I don’t believe I said anything about adding the mint just yet.” Wand quickly unholstered and in his hand, he very nearly vanished the contents of her cauldron, but, for better or for worse, decided not to just yet. Luckily for her, it was currently the correct colour. He wouldn’t hesitate to make her start again though if the Ravenclaw continued to race ahead of his instructions and thought she knew better. Daisy beamed when Professor Noble complimented her work. Using a non-verbal Cleaning Spell, she made sure her spoon, scales, silver knife and dropper were free from dirt and debris prior to continuing with her potion. Daisy added one mint sprig which made the potion turn green-blue before stirring her potion once clockwise which resulted in the potion turning bright pink. She repeated this process with the other two sprigs of mint. She cleaned her spoon and grabbed her scales and silver knife. She measured out 25g of stewed Mandrakes before using her knife to slice it finely. Daisy was satisfied that the sliced stewed Mandrake resembled pickled ginger just as Noble described so she carefully sprinkled the stewed Mandrake over the top of her potion. Daisy then used her dropper to measure 30ml of the syrup of Hellebore before adding it to the potion. She then let the potion simmer for fifteen minutes while she began to tidy up her work station ensuring equipment that no longer was in use were clean and practicing the wand movement that Noble had demonstrated. Daisy tapped on her throat and then swept her wand from left to right. Vivienne had to admit that non-verbal spells were impressive. And sterilized equipment was important too. She grabbed her ingredients and got straight to work. She decided to stick her earmuffs on just in case one of the mandrakes screamed. She made her station was tidy before Noble came to inspect it. Tina was glad when the helium activity ended, and they moved on to the actual potion making. Finally! This was the part of the class the dark-haired Ravenclaw enjoyed most… careful, certain, little room for error. As long as she followed the directions exactly, nothing would go wrong. She turned to page 57 in her textbook, carefully looking over the recipe. This seemed pretty straightforward, but she paid careful attention to Professor Noble’s demonstration nonetheless. There could be nuances covered in the demonstration that weren’t in the textbook. Tina picked up a tray of ingredients from the side workbench and brought it back to her station. She neatly arranged her scales, mortar, pestle, knife, and other equipment she’d need in a straight line beside her cauldron, performing a quick “Scourgify” on each piece as she went. After a final “Scourgify” cast on she cauldron, she was satisfied that her materials were properly cleaned and arranged and ready to start work. She carefully measured out 50g of fluxweed, double and triple checking to make sure the measurement was exact, and placed it in her mortar; then she cleaned her scales and repeated the process with 50g of billywig stings. She picked up her pestle and began to grind it down. For some reason, she found grinding potion ingredients oddly relaxing. It wasn’t long until Tina had ground the ingredients into a nice, smooth paste. She scooped out the paste and added it to her cauldron. When she was done, she aimed her wand at the burner and cast, “Incendio”. A medium-sized flame roared to life, and Tina watched as the paste turned from red to green, periodically glancing at her watch to time it. By the time the change was complete, it had been more like 48 or 49 seconds than 45. Had something gone wrong? The paste was the correct color, so maybe the off timing was just a fluke. Moving on, she added the drops of honeywater one by one, just as instructed. One… two… three… four… five… six… seven… eight. She glanced at the contents of her cauldron between drops to make sure everything looked okay. So far, so good… the potion gradually turned a vivid shade of pink, just as expected. Tina then glanced at her watch, noting the time her potion started simmering, and waited for further instructions. When exactly five minutes had passed, Tina checked her potion again. It had turned orange, but was it the right shade of orange? Too light? Too dark? Just right? Before she had too much time to worry about it, Professor Noble instructed the class to add the mint sprigs one at a time. Tina did exactly as she was told. The potion turned blue-green as she added the first sprig, and for one wild moment, she worried it might not change back to pink. She breathed a silent sigh of relief as she completed her clockwise stir, and the potion turned pink again. She repeated the process of adding and stirring for her two remaining sprigs; then it was time to move on to chopping the stewed mandrake. Tina used her scales to measure 25g of stewed mandrake then picked up her silver knife, holding it the way Professor Noble demonstrated. Holding the knife this way felt a little odd, but she could manage. She chopped the mandrake as finely as she could, hoping the result would bear close enough of a resemblance to pickled ginger. When she was finished, she sprinkled the chopped mandrake over her potion. Now all she had to add was the hellebore syrup. She measured out exactly 30ml and poured it into her cauldron, watching with anticipation as it turned blue. She made a note of the time, then proceeded to tidy up her station as the potion simmered. She cleaned her materials and placed them back into her potion kit, and when she was fished, practiced her wand movement a few times. Throat tap, then left to right sweep… throat tap, left to right sweep. As she practiced, periodically her eyes darted to her watch or her cauldron to monitor her progress. So far, everything looked as it should! There was no other word for it, Noble deadpanned at the first year putting on earmuffs. It was hardly cold in here with all the burners going, and they were working with stewed mandrake. Did she not think he might have said something if they needed ear protection? Grumbling audibly (to everyone else, at least), he headed over to Vivienne and pulled them from her ears "These," he said, still clearly peeved, "are not required. I will tell you if personal protective equipment is required. These are not fresh mandrakes, and we are not replotting plants in herbology." Did he make himself clear? With a grunt, he left the earmuffs on her desk, and went to look at other people's work. Thankfully, others in the classroom were fairing better. Daisy's potion was simmering along nicely, and her workbench admirably clean and tidy. "Great job. You'll be able to take some with you to try after its been marked." And someone else with a beautiful work area and good looking potion? Tina. "You too, Tina," Noble said as he walked behind her. "Decent work indeed." Which from Noble, was quite the complement. He raised his voice over the sound of simmering cauldrons as he made his way back to the front of the class. "When 15 minutes is up, complete the wand movement. As a reminder, it's a gentle tap on the throat and then a sweep of your wand left to right over the cauldron. Like so." He demonstrated over his own potion, which let off a few golden sparks. "With those sparks, the potion is complete. If yours doesn't spark, try simmering it for a further 15 seconds before trying again." Assuming it was sunshine yellow, of course. If it wasn't, they had much bigger issues. "When your potion is complete, please deposit two labeled vials of it in the tray at the front." He gestured at the tray for reference, but it was hardly a new concept. "You may then tidy up and head to lunch a few minutes early. I'll mark your work, and if it's deemed safe, you'll be able to experiment with it. Just rub some potion on your throat, and think about how you'd like you voice to sound." Simple enough. Was there anything else? "Oh, and Professor Adara and I will be hosting extracurricular brewing tomorrow evening, if you'd like to join us." ooc note: I'll leave this open for a few more hours for you to finish up. Thank you all for joining! After fifteen minutes of simmering, the potion had turned a shade of sunshine yellow. Daisy used her wand to gently tap on her throat before sweeping her wand over her cauldron from left to right which resulted in golden sparks being released. Soon, Daisy carefully filled up two vials of potion which she each labelled. She then placed the two vials in the tray at the front, before she finished tidying and packing up her workstation and departed the classroom. "Goodbye, Professor Noble," Daisy said as she exited the classroom. Tina beamed, nodding politely in reply as Professor Noble complimented her work. “Thank you, Professor,” she said, then turned her attention back to her potion. The simmering time was winding down. After the fifteen minutes were up, the liquid had turned a nice, sunny shade of yellow, just like the instructions said it should. She gently tapped her throat with her wand and swept it in a left to right motion over her cauldron, and a small shower of golden sparks appeared. Yay, she did it! She deposited both vials on the tray at the front of the room, then returned to her station to finish tidying. She performed a quick “Scourgify” on her cauldron and spoon, placing them back in her bag along with her other supplies, and repeated the scouring charm on the workbench itself. Call her a neat freak, but she firmly believed in leaving things in the same condition that she found them! On her way out the door, she paused, looking back at the professor. “Bye, Professor,” she said. “Thank you for the lesson!” It turned out to be rather enjoyable! Noble was EXTRA grumpy today. Geez. Nettie had assumed because the whole thing was up that he was ok with them going forward but apparently not. She paused and waited for him to catch up, taking notes as he did so and making sure her potion didn't dry out on her or get gross and clumpy. Thankfully she'd only skipped ahead one step or so - which meant she was back on track rather quickly, thank goodness. This was always the worst part. Having to WAIT for the potion to be done. SIGHHHH. She began to clean up and practiced her wand movement. Finally, 15 minutes was up. Her potion was yellow, just as described by Noble. She smiled and tapped her throat, then moved her wand from left to right over the cauldron. Done! She grabbed two vials and her quill and scribbled her information on them before turning it in.